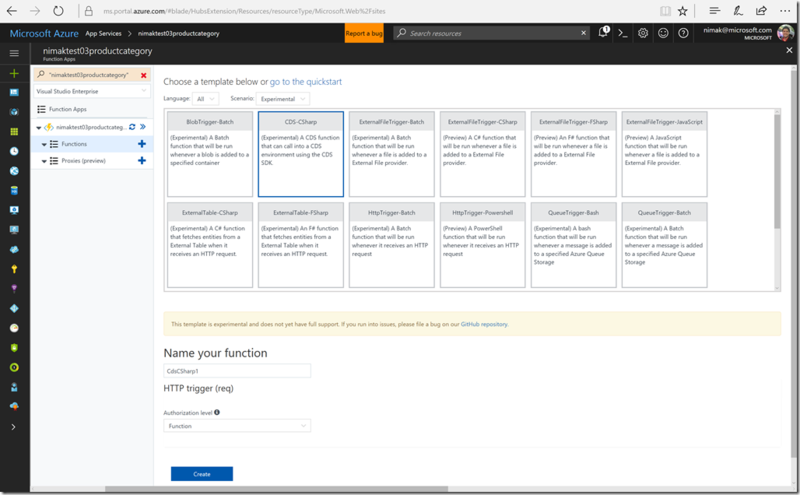 If you are looking for a way to combine data and actions across services and applications to extend the functionality of your PowerApps, you can make use of Azure Functions templates for the Common Data Service (CDS). The Common Data Service is a Microsoft Azure-based service that enables app creators to easily build new applications or extend their existing applications. Using Azure Functions means taking full advantage of a serverless architecture features like dynamic scaling, paying only for usage, as well as easy management and development. By combining the best of all worlds with Azure, the Common Data Service and PowerApps, professional developers can expand the capability and logic to meet your needs. With the introduction of this Preview feature, you can now build Azure Functions for the Common Data Service. This functionality is directly tied to Common Data Service SDK which has been released into a Private Preview program beginning on May 4, 2017. CDS template function creation experience. This functionality will release with an experimental template that can be used by developers to easily create a function and use it to program against the CDS interfaces. The function API can be shared with makers across your organizations. Putting complex logic and actions into your PowerApps has never been so empowering. 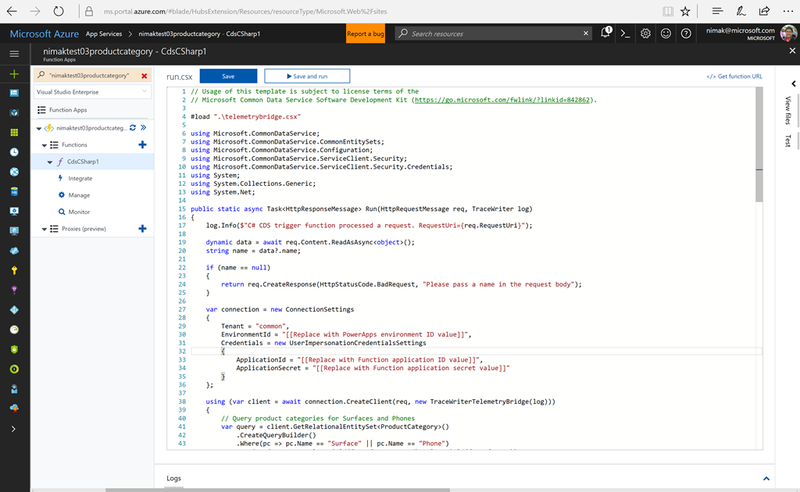 It’s easy to get started with the experimental version of the CDS C-Sharp template in Azure Functions. First you will need to setup a few things such as a CDS database in PowerApps, an application registration in Azure AD, and a simple console app for calling the Azure function. You can refer to the template readme on GitHub for instruction on how to get started on these steps. The programming interface used in these functions is the CDS SDK, for which a private preview program has recently started. To join the CDS SDK private preview program, you can email: cdspreviewprogs@microsoft.com. Upon your acceptance into the Private Preview program you will get access to additional support and documentation for the CDS SDK. Like most other Microsoft enterprise services, the Common Data Service depends on Azure Active Directory for authentication and security. All calls to the Azure function created above are authenticated against AAD, and the function runtime uses the CDS SDK to performs data operations “on-behalf-of” the calling user.